← Kenko Handstrap in 3 exciting colors! SAN DIEGO, Aug. 24, 2011 — Sony is taking professional quality imaging and artistic shooting options to new levels with the introduction of the new α NEX-7 camera. Styled in magnesium alloy for strength and designed with a unique blend of classic and modern inspiration, the new compact interchangeable lens model weighs only 10.3 ounces (291g). The NEX-7 camera features a new Exmor™ APS HD CMOS sensor with 24.3 effective megapixel resolution – highest in its class — that complements the latest generation of Sony’s BIONZ® image processing engine. This unique combination of sensor and processor technology delivers flawless image and HD video quality with very low noise and exceptionally fast shooting responses. An ultra-high sensitivity range extends from ISO 100-16000, making it easy to capture clean, low-noise images in dimly lit interiors or exteriors. Response is accelerated even further by a shutter release lag of approximately 20 milliseconds– the fastest of any interchangeable lens digital camera (as of Aug 2011). In speed priority continuous mode, the NEX-7 camera captures fast-moving action at up to 10fps (AF/AE is fixed) – the world’s fastest burst shooting speed of any mirrorless interchangeable lens camera (as of Aug 2011). The NEX-7 model offers extensive, direct control over creative settings via an intuitive new TRINAVI control interface, important for enthusiast and professional photographers. Two control dials on the top of the camera are complemented by a control wheel, giving users three customizable, manual controls and the ability to create images with the flexibility and precision of an advanced DSLR camera. The NEX-7 model is also the world’s first interchangeable lens camera (along with new α77, α65) that features an integrated XGA OLED TruFinder™ viewfinder for precision framing and focusing. The viewfinder provides a bright, detail-packed, high contrast view of still images and video, with approximately 100 percent frame coverage and a wide field of view that rivals pro-grade optical viewfinders. On-screen grid lines, various shooting parameters and a level gauge can be displayed to assist with accurate framing. With the XGA OLED TruFinder™, the NEX-7 model realizes the ideal of a compact, rangefinder style camera with an eye-level, through the lens viewfinder. The XGA OLED Tru-Finder™ viewfinder is complemented by a three-inch Xtra Fine LCD™ display that can be angled up to 90-degrees up or 45-degrees down for easy viewing in any shooting position. TruBlack™ technology assures superb detail and contrast, while dramatically reducing on-screen reflections. At the touch of a button, the NEX-7 camera shoots smooth AVCHD Full HD movies with high-quality stereo sound. Support for the new AVCHD Progressive (Ver. 2.0) format allows users to capture Full HD video at 60p (progressive) frame rates. for beautifully smooth, detailed video footage. 24p video shooting is also available. The Tracking Focus feature lets users select a target object on screen and focus on it accurately, even if it is moving. Additionally, manual focus is now possible during video shooting. Enthusiasts can also enjoy full control over creating the perfect video image with Program, Aperture/Shutter Priority and all-Manual modes (P/A/S/M) – just like the most advanced DSLR cameras. Stereo audio quality is improved, with revised circuitry that lowers noise levels, especially when shooting quiet scenes. First introduced on the NEX-C3, Picture Effects enables easy “in camera” production of sophisticated artistic effects without the need for a PC or post-processing. The camera features 11 modes and 15 effects, including new HDR Painting, Soft Focus, Miniature and Rich-Tone Mono. A generous palette of other artistic imaging functions includes 3D Sweep Panorama™ mode, Soft Skin, Auto HDR, Handheld Twilight and Anti Motion Blur Modes. The NEX-7 camera includes an integrated flash system and also features an Auto-lock Accessory Shoe for advanced shooting applications, both of which are firsts for Sony’s E-mount line of cameras. The shoe supports the full range of Alpha flashes and monitors, as well as adaptors to accommodate studio lighting. The LCS-ELC7 soft carrying case combines a snug-fitting body case and leather lens jacket to help protect the body and lens from scratches and dust. It’s complemented by the STP-XH70 shoulder strap, made of the same material. 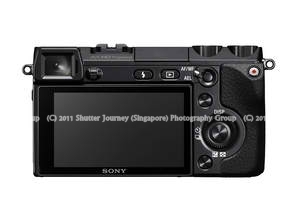 The new NEX-7 is compatible with Sony’s Memory Stick PRO-HG™ DUO HX series as well as Sony’s full line of SD memory cards. Available in capacities up to 32 GB, both media enable necessary transfer speeds for stable and optimal performance of Sony’s hardware features, such as full HD movie shooting. The α NEX-7 ultra-compact interchangeable lens digital camera will be available this November in a kit with an exclusive black 18-55mm zoom lens for about $1350, or as a body-only for about $1200. The new camera and all compatible lenses and accessories will be sold at Sony retail stores (www.store.sony.com) as well as other authorized retailers throughout the Sony dealer network. This entry was posted in Brand: Sony, Photography Articles & Videos, Uncategorized and tagged Alpha, Sony. Bookmark the permalink.